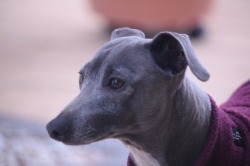 I am also involved in iggy rescue, saving dogs from pounds and rehoming them. The current rescues are listed below. These dogs are looking for their forever homes. They are desexed, vaccinated, wormed, microchipped and heartworm tested. They are $350 each or $500 if two are adopted together. If you are interested in offering either of these dogs a forever home, or have any questions about them, please email me. 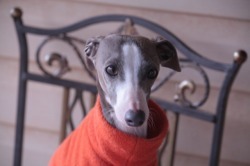 For my information on iggy rescue please see iggyrescue. 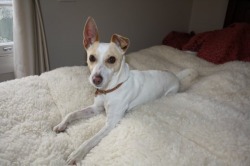 Peppi is a 2 yr old iggy/foxie cross who has only recently come into care. He is a lovely little guy, with a curly tail and 'undecided' ears. Peppi is a bright happy little boy who loves chasing tennis balls. He will bring the ball back to you every time, with a huge smile on his face and his little curly tail waving madly - check out his tail in the pic below! He is a true laptop, he loves to jump into your lap for a cuddle and will snuggle up and go to sleep there. 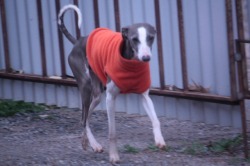 Peppi is being fostered in Gippsland Vic, and is available for interstate adoption. Peppi must go to a home where he will be allowed inside to be part of the family. He would love a home where he has another little dog for company, or with someone who is home most of the time. This is Romulus. 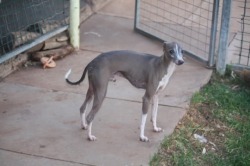 Romulous and Remus were found in a Canberra pound. Their owner did not claim them so both boys ended up with iggy rescue. Romulus is estimated to be around 6 yrs old. He is a little overweight but appears to be in good health. Both dogs are friendly and good with other dogs. They are a little too interested in cats however and would require further training to live in harmony with one. These two are affectionate and gentle pets, who are happy and thriving in foster care. Rommie relies on Remus so they need to find a home together. This is Remus, he appears to be around 2-3yrs old. As you can see Remus is quite underweight and will need to gain weight before he can be adopted. 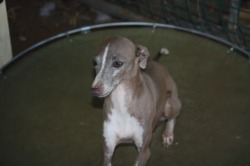 Oliver is a 6yr old blue and white male italian greyhound. Oliver is a smaller iggie with a lot of personality. Having been raised around children Oliver is great with kids and very social. 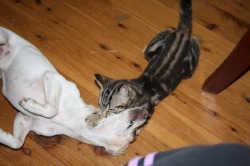 Oliver loves playing with my iggies and needs a home where he will have a doggie companion. Being 6 yrs old Ollie is well past the puppy 'sillies' and is a lovely calm boy. 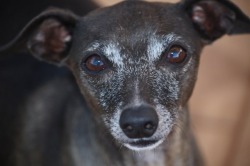 Italian greyhounds often live to 15, so Oliver should have many more years ahead of him. Oliver was neglected in his previous home and was very thin and dirty when he arrived. he has now gained weight and is a picture of health. He has a good appetite and is not a fussy eater. He is best friends with Coco (pictured below) and would love to be rehomed with her, however he would also be fine to be adopted on his own. He can be a little dominant with entire male dogs so a home with a female or desexed male doggy would be best. Having spent all his life outside until he came he live with me, Oliver was not toilet trained. He is working on his toilet training but is not reliably trained yet. I put a doggy diaper on him when he is indoors to prevent any accidents. Ollie needs a home where he will be allowed inside, he LOVES snuggling in bed and will sleep all night under the covers without moving. He is very much a lapdog and is very affectionate. He is great on lead and in the car. Oliver is very responsive and keen to please, he is a bright animated little dog who will worm his way into your heart in no time. 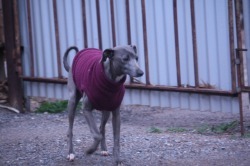 Coco is a 6yr old seal coloured female italian greyhound. Coco's coat is very glossy and beautiful, she is on the taller side and is around 17 inches at the withers. 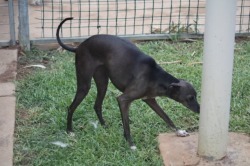 Coco is great with children and very sociable with people, she is a very outgoing and obedient little girl. Coco was overweight when she came into care but with good diet and plenty of exercise running around with the other iggies, she has slimmed down. 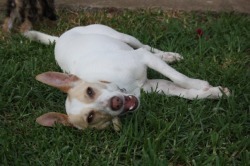 Coco is a happy outgoing affectionate little dog, who loves to be in the middle of whatever is going on. Coco was poorly socialised with other dogs when she came into care but has since settled down and gets along with all the other IGs here, both male and female. Coco needs a home where she has another doggy companion if her new owners work all day. As she can be a little dominant with other females a male companion may be best for her. Coco also needs a home where she will be allowed inside to be part of the family. Although Coco was not housebroken when she came into care, she has been working on this and has improved. Coco needs an understanding owner who will continue with her housebreaking, and understands she may have an accident occasionally until she is fully trained. Coco is great on lead and travels well in the car. She loves running around the backyard with the other IGs and is a good little watchdog. 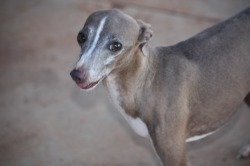 Italian greyhounds are a long lived breed, often living for more than 15yrs so Coco has a good many years left in her. Being 6 yrs old means she is no longer a silly puppy and she is a lovely calm settled dog. Coco has not had an easy life, and she needs a forever home where she will be pampered and adored for the rest of her days. 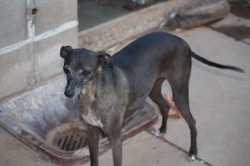 She is a beautiful little girl very very gentle with people, and just wants to please.